I've finally added Harry to my list. Though many of my friends here at GoodReads have given it very high marks, it simply didn't move me. Perhaps, if I had come to the books when I was 8 or 10, I'd be more impressed (though my reading was pretty sophisticated even then -- I was devouring The Silmarillion at 11). 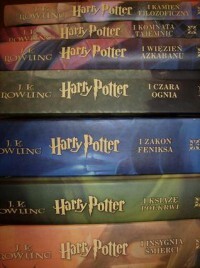 And I would (and do) give the last few volumes 3 stars -- Harry was getting older and more interesting -- but I didn't find anything particularly amazing or innovative about the characters or plot. Perhaps, in the final analysis, that's my "problem" with the series: It didn't push the envelop. Perhaps, unfairly, I wanted a more challenging read. I would recommend this to young readers just getting their feet wet, and then guide them into more (IMHO) challenging authors like Norton, Le Guin, Tolkien, White, etc. (i.e., the deep end of the pool).